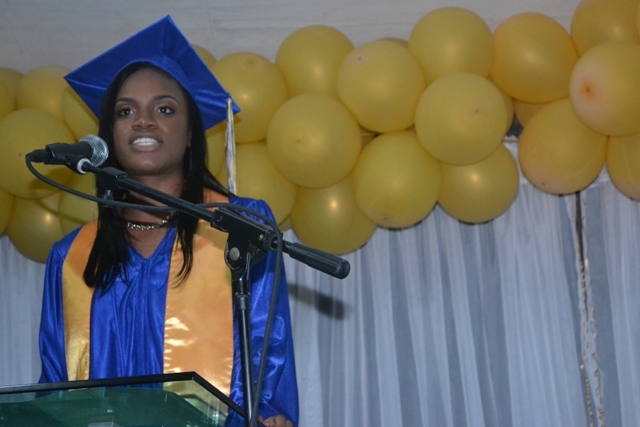 NIA CHARLESTOWN NEVIS (November 18, 2015) — Valedictorian of the Charlestown Secondary School’s graduating class of 2015 Nekhaila Tyson told her fellow 138 graduands that they should not allow themselves to be divided by colour, class or circumstances but instead, support each other as they moved forward to a new stage in their development. “Too often we bear witness to persons trying to pull down one another instead of seeking to uplift each other. Before we do this let us remember that Nevis does not have gold and diamonds like South Africa nor oil like Trinidad and Venezuela. “We aren’t fortunate to have a rich biodiversity of plants and animals like Brazil, neither do we have many rivers and streams like Scotland and Dominica. Therefore, at the end of the day, our most valuable and precious resource is our people. Consequently, let us be supportive of each other’s individual talents and efforts,” she said. 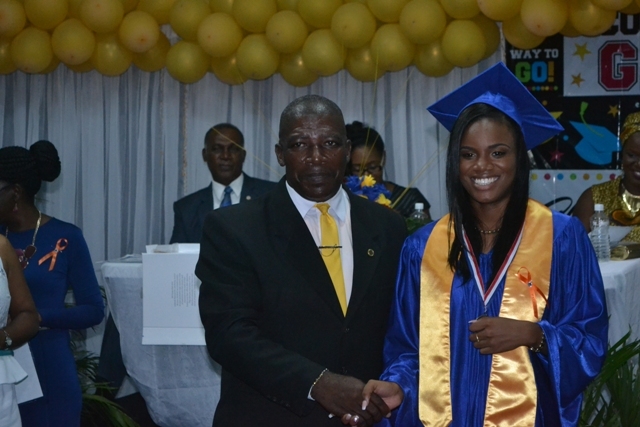 Tyson who is the top CSS student for the Caribbean Secondary Education Certificate (CSEC), told her colleagues, that they have a role to play in the development of Nevis. She said even though their talents and skill-sets may be different, they had a role to play in painting the bigger picture. Therefore, it is incumbent on them to move forward together and paint a Nevis of which they could all be proud. Meantime, she had special words of support for fellow graduand Juwan Evelyn who was diagnosed with leukemia two weeks after his final exam and is currently undergoing chemotherapy treatment. She said despite his health condition he attained nine subjects with seven distinctions. He celebrated his 17th birthdate one day before graduation day. “We, the members of the class of 2015, stand in support of his fight against leukemia, as we proudly wear these orange ribbons to bring awareness to this disease,” she said. 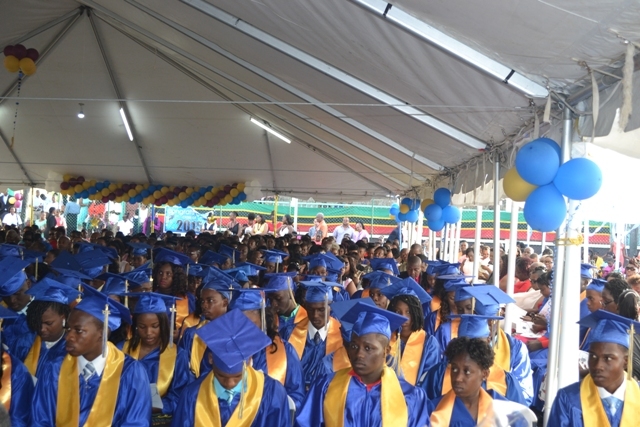 The other valedictorians are Tyler Martin for his performance in the Caribbean Advanced Proficiency Examinations (CAPE) and Chris-Andrew Smith for his performance in the Caribbean Certificate of Secondary Level Competence (CCSLC).